The third annual UNFD boat cruise is set to take place on Saturday 31st January on the picturesque Sydney Harbour. 2013 saw Northlane, In Hearts Wake and Endless Heights start what has now become a yearly event with 2014 hosting In Hearts Wake, Hellions and Hand Of Mercy. The headlining torch has now been passed along to Sydney's Hellions who will also be celebrating the release of their second album on the same weekend. 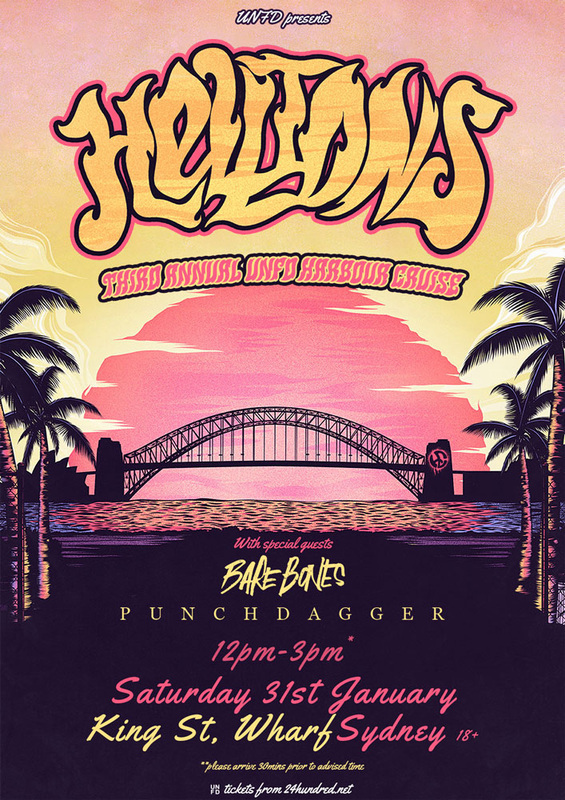 Hellions have had an extremely busy 18 months with an appearance at the Sydney leg of the Vans Warped Tour, tours with In Hearts Wake and Hand Of Mercy and most recently, an outstanding performance at the inaugural UNIFY Gathering last weekend in Tarwin Lower. Tickets for the event are just $23 and are available from 24 Hundred. You will be able to catch sets from not only Hellions, but Sydney locals Bare Bones and Punchdagger. Departure point is King St Wharf and as the boat will leave at 12pm sharp, ticket holders are advised to arrive no later than 11:30am. 24 Hundred will also be offering a special ticket and CD bundle for Hellions' new album Indian Summer for just $35. Various Indian Summer merch bundles are also available.